A Valentine for your inner child? why not? You are here: Home / Emotional Abuse / A Valentine for your inner child? why not? Suddenly I found myself grabbing one of the balloons...and my left hand felt curiously small, kind of tiny...it would not let the balloon go as I went through the cashier. 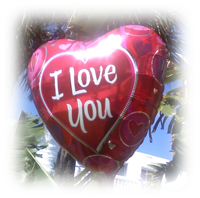 She rang everything up and I found myself walking out with a gorgeous red balloon with the "I love you" message screaming across it. My rational mind asking: what's going on here? why did you buy this balloon? who is this balloon for? And the answer was loud and clear: this balloon is for my inner child...Of course! she needs to hear from me, her adult self, that I cherish her! And this is a good opportunity to tell her, with all my love, that I recognize her, appreciate her tenacity and ability to resist oppression without denying the joys of life. She was a joyful survivor, never a bitter one. Always finding in a bit of sunshine, a flower, or a smile, the energy to keep living, learning and dreaming a better future...Of course you are my Valentine! To my inner child, now I'm sending this loving Valentine; you deserve it more than anybody else. Wherever the alternative time you are in now, you are in my heart, always...thanks for surviving everything and bringing me here and now!